It took four years for Amazon in India to grow the marketplace from zero to 200,000 sellers. But just over a year to double from 200,000 to 400,000 sellers. At the current pace the marketplace will have grown by 150,000 sellers in 2018. It took more than three and a half years to reach that number when the marketplace first launched. 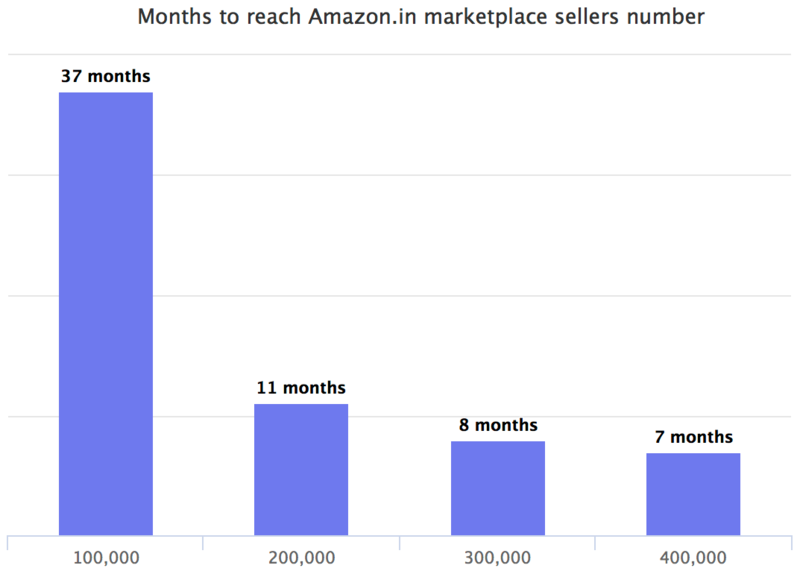 Amazon launched in India in June 2013 and according to our research it took the company 37 months to reach the first milestone, 100,000 sellers, in July 2016. It then took 11 months to double to 200,000 sellers in June 2017. Since then the marketplace growth has accelerated reaching 300,000 sellers in 8 months in February this year. Only 7 months later it reached 400,000 in September 2018. Five years after the marketplace launched sellers now offer over 170 million products to customers. Prime selection in India includes more than 40 million products. In fact, when Prime launched July 2016, India became the fastest-growing market globally. Within a year, one-third of products delivered were in Prime. Big driver for this growth has been India-first innovations, along with the standard ecosystem offerings. Services like Easy Ship and Seller Flex, and the recently revealed “Select” program to help brands grow were first launched in India. Fulfillment by Amazon (FBA) warehousing consisting of 67 fulfillment centres has been a factor too, not unlike in other Amazon markets. FBA has especially enabled sellers from tier II and III cities to participate. In India sellers are able to register for and manage their Amazon storefront using only a smartphone. The seller app is secondary in other locations, with most sellers using the Seller Central web portal. In India it is primary. As Gopal Pillai mentions, many sellers don’t have a laptop or any other means to access the web outside of using their phone. Earlier this year Amazon Senior VP and CFO Brian Olsavsky said India continues to be a “good story”. Despite more than $3 billion in losses from Amazon’s all international operations last year. The company has already invested billions of dollars into its Indian operations, with more committed for years to come. For example, last month Amazon and Indian private equity firm Samara Capital have bought Aditya Birla Group-owned “More” retail chain for $580.35 million. Since its launch in 2013, it has committed over $5.5 billion to India. Amazon.in is one of the most visited websites in India, ahead of Flipkart.com, according to estimates by SimmilarWeb. Flipkart is Amazon’s primary competitor in India, famously acquired by Walmart for $16 billion in May 2018. Walmart, Amazon, and other companies including Alibaba and Microsoft are betting on India because in five years both the number of online shoppers and total e-commerce spending is expected to double. That’s 2x by 2022. This year more than 226 million people in India will buy something online. One unique feature of the Indian e-commerce landscape: by law, e-commerce companies are only permitted to operate as marketplaces. There are further laws governing foreign businesses selling to Indian shoppers (Cloudtail India Pvt. Ltd, a joint venture between Amazon and Catamaran Ventures, is the biggest seller on amazon.in). The government is working on further regulation of the e-commerce sector. We have previously called India the “most important e-commerce battleground to watch”, and it remains one - retail e-commerce sales will make up only 2.9% of total retail sales in 2018. The country is also unique in that mobile shopping is driving the market, big portion of the population came online only through mobile. Earlier this month Amazon launched a version of its mobile website and smartphone app in Hindi, going beyond English. Small retailers control close to 90% of India’s more than $700 billion retail market, according to Indian retail consultancy Technopak. Unlike in the US where big-box retailers like Walmart and Costco control the market. Many of those small retailers, tiny stores known as kiranas, are now turning to marketplaces to reach beyond.